Jeremiah 18:3-4 NIV "So I went down to the potter's house, and I saw him working at the wheel. 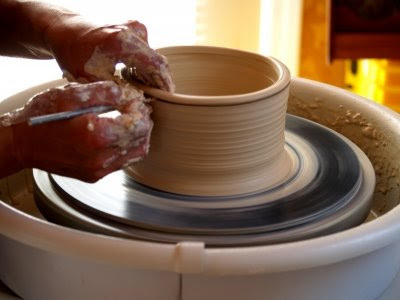 But the pot he was shaping from the clay was marred in his hands; so the potter formed it into another pot, shaping it as seemed best to him." Mold me each day, Lord, into what You would have me to be. I love to go out in the yard in the afternoon and evening when the light from the descending sun is so beautiful and the shade from the surrounding trees is simply perfect. I like to face the field behind our house and watch the breeze rustle the leaves overhead; it's very relaxing. I find a great deal of inspiration in those times, and quiet times are wonderful for hearing from the Lord. A couple of weeks ago as I was enjoying my usual view, it suddenly hit me that the entire field of wheat was now golden. I had just been walking past the field and telling my children how it reminded me of the ocean when the wheat would wave in the wind, so I knew it had been very green. It was as if overnight it went from completely green to completely gold. No slow fade, no gradual change, just abrupt and complete difference. I felt in that moment that the Lord was teaching me about how quickly things change in our lives. We don't know when it will be - what week, what day, not even what hour - that the seasons in our life will shift. It seems really simple and probably a very basic knowledge, but it was one of those light bulb moments of truth for me in my own life. Take a tree, for instance... A tree does not choose when the seasons will change. It does not know from day to day when the weather will cool and its leaves will fall, leaving it completely bare. Nor does it know from day to day when the weather will warm and its blossoms will begin to adorn those long arms again. A tree changes with the seasons automatically and without contemplation. We are certainly not trees, and often we know the seasons in our lives are beginning to change well in advance of them actually doing so, although there are times that they change unexpectedly. However, if we have placed our trust in the Lord, if we have surrendered our will to Him, and when we put aside our own plans to put His will above our own, then we have no need to fear in any of the seasons of our life. There will be the wonderful seasons when everything seems to be perfect and wonderful, and at these times we need to soak up all we can of the Lord and His presence and His word and His wisdom. Because the fact is, seasons change. There will be seasons of winter, seasons that feel like utter desolation and, at times, like bitter cold in our heart, and at those times we must lean on the strength that only God can give, and run to the arms of the only One who can walk us through - our Savior, Jesus Christ. Seasons change, but when we put our trust in God, we have peace that He is going to bring us through all of the hardest seasons of our lives into the glorious peace of the very best seasons in Him. Is What You Want What God Wants for You? "Give in to the craving..." was the logo I saw on a sign today as I drove past a fast food restaurant. I immediately began to think about how these words seem to define the time we live in. There is so much focus on self-indulgence...on getting what WE want in order to be happy. The question is this; is what we WANT actually what we NEED? And furthermore, is what we want what God wants us to have? We live in a culture of "Give me what I want, and I should have had it five minutes ago..." What we want is not always bad, but we have to evaluate our wants and desires to see if they are good for us and are things that will please God. This is a bit of a simple example, but we'll just start here: The sign I saw today was for some type of new food on the menu at this restaurant. Would it have been delicious? Probably. Would it have been satisfying? Most likely. So what would be the harm in it? I had not eaten anything all day so I did need food. But, this is where evaluation comes in. First of all, could I wait to eat until I went home? Yes. Secondly, was this in my budget? No. Thirdly, was I willing to sacrifice most of my weight watchers points for the day on this item? No. In the case of something like this, the decision is easily made using common sense and conventional wisdom. But what about when it's not an item on a menu? What if it's something much less trivial than a fast food order? I won't give examples here because there are just too many, but we all have different desires, and you can fill in the blank with your own. In all cases of what we want, we must evaluate the cost, the end result, and sometimes the consequence. But most importantly, we must seek the Lord and hear His voice and His heart on every decision in our lives. I've heard for most of my life to "Listen to your heart..." in order to find the answers. Well, here is the cold, hard truth - the heart can be deceived. Our heart is the seat of our emotions, and basing our decisions on "listening to the heart" can lead us down very wrong paths and cause us to make extremely wrong decisions. Our feelings can be very wrong at times, and it's imperative that we make sure that what we feel and what we think are lining up with the Word of God and with HIS heart. Feelings are often based on circumstance, and God can quickly change the circumstances we find ourselves in. You may have wanted something for years, and feel entitled to it, feel that you deserve it, feel that you can't live without it; but what will be the end result of getting that desire fulfilled? Will it bring peace and contentment, or will it just make you want more? Psalm 37:4 says "Delight yourself in the Lord and He will give you the desires of your heart." The key phrase here is "Delight yourself in the Lord..." If we are truly delighting ourselves in Him we will find that our desires become very different. The focus shifts from "What do I need?" to "What can I do for others in need?" and "What do I want?" to "What do You want for me, Lord?" and from "This is something I deserve!" to "What can I do to serve?" We will find the most happiness, contentment, peace and fulfillment when we are chasing after the heart of God, when our desires line up with His desires for us, and when pleasing Him becomes more important than pleasing ourselves. Where is the "Undo" Button on this Thing?! Last week my son wanted me to play some games with him. We played Uno, checkers, something akin to Jenga, and chess. Now my son likes to play chess on the computer because before you make any move you can have the computer show you every possible move you can make, and it will not allow you to make a move that will put your king in danger by accident. Also, as if this is not help enough, there is an "Undo" button that you can use any time you don't like the direction the game is heading. Perhaps in moving your bishop to take the opposing rook, you don't notice the danger posed by the opposing queen who swiftly snatches up the offending bishop; no problem, just click "Undo". You could also call this one the "Easy" button. While Jordan thoroughly enjoys playing this way on the computer, he was not prepared for what a game with a person would entail. Now, I am by NO means an expert chess player. While I do enjoy it, I am someone who is ready to move on to something new, not spend half of my afternoon plotting strategy that will ultimately not gain me anything of worth, besides bragging rights... So, we sat down and began to play, and he was really into it at first. But then, he made an unwise move and lost his queen. Immediately, he snatches up his queen and starts yelling "Undo! Undo!!!" After about two minutes of explaining to him that I am not a computer and this is what it's like to play against people, he gives up - not just on the fight to regain his queen, but he is now frustrated and just wants the whole game overwith. As I sat there and thought about it, I realized that this is how we often feel in life. We mess up, we open our big mouth, we don't say what we should have, we don't do what we should have, we forget something important, we fall, we sin; and suddenly our mind is crying "UNDO!" However, in life, as in the chess game, there is no undo button. When we make a wrong move there is no going back. We can cry, we can grit our teeth, we can bang our fists, but we can't undo what has been done. And yet, hope is NOT lost. It's not over! Life moves forward at a frighteningly quick pace. And that, my friends, is the point... it moves FORWARD. We so often make the wrong moves on the board, and often lose important players (people or things) that meant so much to us; and no matter how much we might wish for it, we can't get them back. But we don't give up! We keep moving forward. We set our feet firmly on the ground, we look to the Lord for guidance in our next moves, and we don't look back. Paul said in Phillipians 3:13, "But one thing I do: Forgetting what is behind and straining toward what is ahead, I press on toward the goal to win the prize for which God has called me heavenward in Christ Jesus." We don't actually forget what is behind - we don't actually wipe our memory clean - but we change our focus to what is before us. Our memories, good and bad, serve to aid us in our daily walk. They help us to remember what is important, while not making the same mistakes over and over. There is no "Undo" button in life. But there is wisdom to make the right decisions and move on. When I was a child "Transformers" were a really big deal, and as with all things they have now come full circle to become an even bigger deal. My son now likes them more than I did as a child (I was quite the tomboy! )...yes, I had a transformer when I was a little girl! But what exactly is the allure of Transformers? You have a vehicle/machine of some sort that has the ability to transform into something incredible - a giant fighting robot that can talk and shoot lasers; a transformation that is possible because the machine is full of LIFE. Have you ever seen a "transformer"? Not a living robot, but a person who has been transformed by God, completely changed by the Way, the Truth, and the LIFE. If you have, it's not something you have to wonder about or question, it's unmistakable. And it is beautiful. Sometimes you can know someone for long enough that you basically know what to expect from them. You see how they act, hear how they speak, and in some cases you know for the most part how they feel or what motivates them. And then, you don't see them for a while, or maybe you only get the chance to talk to them every once in a while, but suddenly out of the blue there they are...and you see the change. You will not forget it when you see it; to see how incredibly God has worked in the life of another sort of brands itself on your heart. To see a person transformed from who they used to be into someone full of the power of God, full of His glory, full of faith in Him, and walking upright in His power and might is such an edifying experience. We are all a work in progress, being transformed daily into the image of God...IF we allow Him to change us. There have been many times that I have regretted things I have said and done or beaten myself up over mistakes in my past, but the truth is that everything in my life up until this point has helped shape me into the person I am now. All of the best things in my life, the best things I have done, the things that were not a step above mediocrity, the failures in my life, and the very worst of me - all fit together to make up who I am. I am a transformer, constantly being changed into who God has made me to be...through my relationship with Him, through my experiences in life, through lessons learned (most often the hard way). I hope that when people see me they see a life transformed, a woman chasing after God with ALL that I am, and a heart that will never be satisfied with anything less than all that He has for me. I hope that when people see me, they see a transformer. 2 Corinthians 3:18 "And we all, who with unveiled faces contemplate the Lord's glory, are being transformed into His image with ever-increasing glory, which comes from the Lord, who is the Spirit." The other day I was out running errands which required me to drive in a really pretty area on a beautiful day with lots of time to...think. As I passed such gorgeous scenery and my mind began to wander, I found myself driving through a dense fog of memories. You may ask why I was driving through a "fog" of memories instead of dancing lightly on moss colored paths of rose strewn memories, and I will tell you. When you are driving down the road where there is thick fog, it decreases your visibility. You are unable to see in front of you or around you effectively. You have to go slowly and your way is darker because of the visual obstruction caused by the fog. Well, memories can be like fog. Memories can be good or bad, but they are just that...memories. They are not forward motion, but a glance behind. And when our memories consume us, rather than being able to move forward, we find our path obstructed. What the Lord showed me as I drove home that day was how our lives are very like our car driving down the road. He showed me how He has us on a particular path, going to specific destinations in life, and it is our choice whether we will stay on the path appointed for us and do all that He has called us to do, or whether we will choose our own way and allow distractions to pull our attention down the wrong road. I saw lots of interesting looking paths off to the side of the road: country trails, side roads, beautiful fields...but none of these places were going to get me to my destination. And if I went the wrong way, I would simply have to backtrack and take longer getting where I was going because I got off the right road. It's so very important that we hold God's hand tightly and walk with Him, beside Him, allowing Him to lead us in the right direction. Our ways are not His ways, so trusting the direction we think we should go without first waiting to see if He is leading us there will sometimes set us back a long way or land us in an entirely wrong place. One thing that God showed me so clearly was how important it is to look ahead. The dense fog of memories were behind me, and I could look in the rear view mirror to see where I had been, but He showed me that if we continue to look in the rear view mirror at what is behind, then we are no longer able to see what is ahead. If our focus is not set on the road before us, then we will not be able to go very far on it. Staring in the rear view mirror while trying to drive forward will almost certainly lead to a wreck. We have a choice to make...to hang onto the past and remain caught up in the "woulda's, coulda's, and shoulda's," or in the has been's and all of the good old days, or bad old days in some cases; OR we can set our eyes on the road before us, listen for the voice of the the Sovereign Lord who only wants the very best for us (Jeremiah 29:11), and follow HIS path into our future. The best is yet to come. Believe it, and let go of what is gone. I love how God speaks to us in so many different ways. One tool that He has spoken to me much through is "The Hiding Place," the story of Corrie Ten Boom. She and her family hid and saved hundreds of Jews during the holocaust, and were punished severely when they were caught. I have been listening to a dramatization of the story on audio, and have found such wonderful wisdom to apply to my own life today. One thing that has really stood out to me is the forgiveness displayed by Corrie's sister, Betsy, and how this affected Corrie...leading her to be able to forgive those who had done such great harm to her and her family. Betsy compared all situations to things that Jesus had gone through, and opened Corrie's eyes up to what true forgiveness and the undeserved grace and love of a holy God really meant for all people, not just for those deemed worthy to receive it. None of us are worthy in ourselves. Another thing that I really grabbed onto in the story was a statement Corrie Ten Boom had made in regards to her sister's death. She said that "God was good...even when Betsy died." She knew that no matter what our circumstance, no matter what we face, no matter what we lose...God IS ALWAYS good. We don't always understand the reason why things happen as they do, and we don't always have the answers, but one thing never changes...God IS good. The Ten Boom family offered a safe place for those who feared for their lives, those who had no hope, and seemingly no chance. God used them, as well as others, to make a difference when it seemed all was at an end. And now, for all of us, no matter who we are or where we're from, God IS our safe place...He is our refuge in time of trouble. He gives us light and leads us when we can't see the path before us. He gives wisdom and peace. There have been many times that I have felt I had nowhere to turn or no one to talk to, no one who could help or understand. But my Lord and Savior is my hiding place, my refuge, my fortress. The enemy can stomp and storm, but my God loves me and holds me tightly in His hands. I have found the best refuge, a place where I am never alone, and it is in His arms. Wow, this is my first post in such a long time! I have truly missed being able to blog, but am so very thankful for the many other things that God has done in my life in the time I have been off. Some people may think that blogging, or writing in general, is a waste of time and they don't have time for it, but even this morning I have visited three of my favorite blogs and God has spoken to me through every one of them! We are so often tools in the lives of others when we allow God to weild us in His hands. We are His mouth speaking truth to the right person at the right time. Always remember that what you have to say is so very important, even if you feel that it is incredibly insignificant! God knows what He is doing and He knows exactly when to work, and who He wants to work through. I will post again later, but just wanted to encourage you to be a vessel that God can pour His love and light through. Be blessed today and follow the Lord with everything you have and everything you are. Please take a moment to check out my new craft blog, Creations by Aprille, where I'm posting my new hats, purses, and all other things crafty! It is still under construction, but I'm going as fast as I can! I am being molded and shaped daily into what God wants me to be. I love Jesus and I want everybody to know it! Thank you for taking the time to stop by! The potter picture above is from creatingonline.com. The rest of the pics were taken by me and are not to be duplicated, emailed, etc. All of the writing is my own, unless otherwise indicated and is not to be copied, distributed, duplicated, etc.